This image is taken from a very old book called "Edinburgh In The Olden Time 1717 -1828". 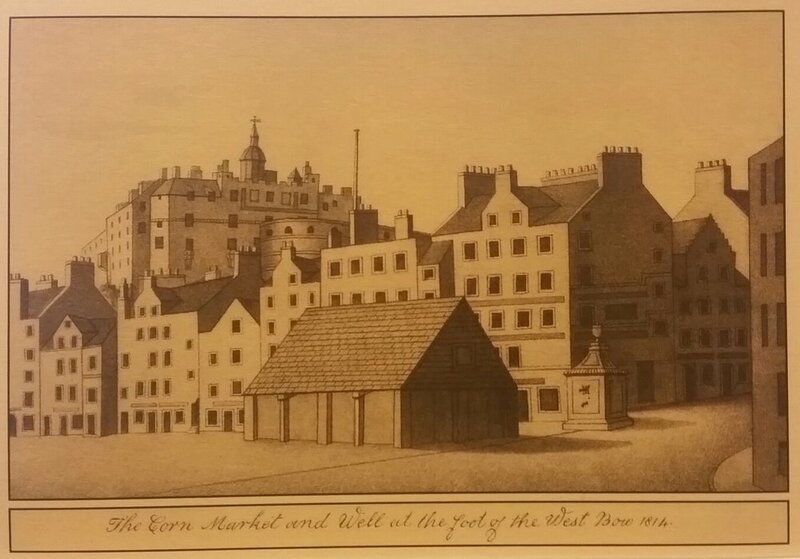 It shows a very familiar view of the Grassmarket taken from the foot of the West Bow but with the added addition of the first Corn Market in the Grassmarket, standing on the site where so many of the martyrs to the "broken covenant" met their end ( and where Scott and Brown many years later built the memorial to them (see picture later). As you can see if you click on the link to this map by Edgar, dating from 1765, the building is clearly visible: http://maps.nls.uk/view/74400010#zoom=3&lat=2712&lon=3084&layers=BT. Prior to this building, the first Corn Market stood in Marlin's Wynd, where Blair Street now stands, but was removed to the foot of the West Bow in 1560. The well at the West Bow was erected in 1681 and stands opposite the site of where Greyfriars Monastery used to be. It has stood witness to many hangings and executions, which started taking place in the Grassmarket in the 1600s (prior to this Castle Hill and the Mercat Cross where the favourite spots for this!). Traditionally, a sword was the preferred means of beheading and in 1564, because the old sword had been worn out, a certain William Macartney was paid five pounds by the magistrates for his "tua-handit sword, to be usit for ain heiding sword". Later, the infamous Maiden was introduced as a swifter means of despatching those found guilty of crime into the hereafter. We all know of James Renwick, the celebrated field preacher who met his end here but have you heard of Isabel Alison and Marion Harvey, two women who were executed here merely for having listened to the preachings of a certain Donald Cargill? And what about the time that the city's former hangman, Alexander Cockburn, was hanged here for having murdered one of Charles II's Bluegowns? This ancient part of Edinburgh has seen much death and poverty - indeed the area around here was one of the first slums - and it is all too easy to see it as a trendy bar and restaurant area but if the walls could speak they would keep you entranced for many hours. Copyright of above image: Scott & Brown (Builders) Ltd. Copyright: Scott & Brown (Builders) Ltd. This image from our company archives shows the Caledonian Hotel just after its big clean in the 1980s. It also gives us a view up the right-hand side of Lothian Road, to where the Standard Life offices now sit. I only read recently in an old book of how Lothian Road came to be and found the story quite amusing. "Apparently, back in 1784 a roadway had been projected to run from the west end of Princes Street towards Bruntsfield Links but many objections had been raised by the proprietors of barns, byres and sheds which stood in the way. An officer of the Royal Navy, Sir John Clerk, Bart., of Penicuik, however, laid a bet with a friend that he would, "between sunrise and sunset, make a road, extending nearly a mile in length, by twenty paces in breadth." It happened to be the winter season, when many men were unemployed. He had no problem in collecting several hundred of these at the Kirkbraehead (could this be where St Cuthbert's Church is at the foot of Lothian Road?) upon the appointed hour before sunrise, when he gave them all a plentiful breakfast of porter, whisky and bread and cheese, after which he ordered them to set to work: some to tear down enclosures, others to unroof and demolish cottages. and a considerable portion to bring earth wherewith to fill up the natural hollow to the required height. The inhabitants, dismayed at so vast a force and so summary a mode of procedure, made no resistance; and so active were the workmen that before sunset the new Lothian Road was sufficiently formed to allow the bettor to drive his carriage triumphantly over it, which he did amidst the acclamations of a great multitude of persons, who flocked from the town to witness the issue of this extraordinary undertaking!" The next time I travel up Lothian Road I will think of Sir John Clerk winning his bet - and of the poor people who had to find a new abode! Erected in honour of the Scottish soldiers and sailors lost during the Napoleonic Wars, building of "Edinburgh's Disgrace" commenced in 1826 and stopped only three years later, due to lack of funds. This image, published in the Illustrated London News 1907, shows how there was a push nearly eighty years later to finish the building work . "The architectural reproach to Edinburgh is likely to be taken away, for at last there is a movement to complete the National Monument on the Calton Hill. The twelve Doric columns were the frustrated beginning of the projected national monument founded during the visit of George IV to Edinburgh in 1822. On the foundation-stone is a bombastic inscription telling how the monument is the tribute of a grateful country to her valiant and illustrious sons. This admirable scheme came to nothing for lack of funds. The twelve columns cost £1000 each and after they were erected no more money was forthcoming, but Mr William Mitchell S.S.C of Edinburgh, is issuing an appeal to the Scottish people calling on them to complete the replica of the Parthenon to be used as the Scottish National Gallery. The view from the Calton Hill is one of the most magnificent in the world. The view of the hill with its spurious ruins and certain unfortunate monuments is less charming, but if the Parthenon were completed Edinburgh would receive a paramount and final claim to be called the Modern Athens. Our illustration, reproduced in colour by Messrs A and C Black, forms the frontispiece to the exhaustive pamphlet embodying the appeal". Take a good look at the image - "Parthenon" aside, there seems to be quite a bit of artistic licence going on. Is that the Ross Fountain next to the Scott Monument?!!? Does anybody know whereabouts in Edinburgh this could be? It is from around 1933 and the homemade barrow that the kids are playing with says "Edinburgh" on its side. It looks almost like the south side. The laying of the foundation stone of the new North Bridge. This wonderful photo is taken from a book entitled "The Ceremony of Laying the Foundation Stone of the New North Bridge Edinburgh 25th May 1896 - Revised and Re-written from the account of the proceedings in the Daily Papers of the Time ." In it we can see the bridge under construction but we also get a glimpse of what the south end of it looked like before the construction of the Scotsman offices. We live in a beautiful city which has been well photographed and documented over the years. However, what about the buildings that COULD have been? We never hear much about them yet it is fascinating to see what was proposed in the past. In the mid 1880s a competition was held to design new municipal buildings for the council on the High Street. This stunning design, taken from The Builder magazine of June 1886, was a serious contender......or is it just a wee bit too fancy for your liking? This photo, photographer unknown, was taken around 1860-1890 and gives us a perfect snapshot of just a few of the many chimneys that used to stand in the city centre. No wonder our beautiful sandstone buildings turned black over the years! How many can you count in the photo? The West End of Edinburgh had quarries too! It is hard to believe as there is no trace of this nowadays, but Craigleith Sandstone used to be quarried at the West End for building work....and sometimes in the oddest of places! Stone was quarried near the site of Miller Row at Dean Bridge in the late 17th century, at Drumsheugh in 1700, and at the land of Coates near the West End of Princes Street. This quarry was still to be seen on the first Ordnance Survey map in 1853 but soon disappeared under housing development. As far back as 1616 stone was quarried at west St Cuthbert's for the Palace Block in Edinburgh Castle and for the Chapel in Holyrood Palace. In 1691, a certain Henry Nisbet of Dean was allowed to build a vault in the churchyard and he also requested permission to quarry there to provide the stone for it Permission was granted as long as he promised to fill it in once he was done and paid a sum to help the poor ( 39 pounds and 10 shillings, not a mean sum! ). It appears that the Church had trouble extracting the money from Mr Nisbet who eventually coughed up after being taken to court - but he also got into trouble for failing to fill his quarry in and for drinking during church services! You can still see his vault today in St Cuthbert's kirkyard. The picture below was taken from the church's website at www.st-cuthberts.net and is of Henry's stone. Perhaps he was having a dig (excuse the pun!) at the Church with his choice of words, which translated read as: " Henry Nisbet of Dean, preferring Fame to Riches, and Virtue to Fame, despising earthly things and aspiring after Heavenly enjoyments, being mindful of death and waiting for the resurrection, in his own life, and at his own sight, caused build this sepulchral monument for him, in the year of our Lord 1692". Sandstone was long quarried at two sites in what is now the city centre. If you walk along Royal Terrace Gardens you may notice the mounds which run alongside the street. These mounds are part of two sites which were known as the Upper and Lower Quarry Holes or the London Road Quarries. No longer immediately obvious, these quarries had an interesting history. In 1650, guns were positioned in the holes to try to thwart Cromwell's advance on Edinburgh. They were also a favourite position for duels right up until the mid 18th century as well as being a place considered ideal for private discussion; no doubt a place where walls DIDN'T have ears! In 1557 the Earls of Arran and Huntly met there to discuss in secret Mary of Guise's activities. Sadly, quite a few people came to an untimely end by falling into the quarries. The owners of the quarries were ordered to fill them in in 1677 but they were left open until the mid-1700s. In 1717 a murderer, Robert Irvine, was hanged nearby and his body was commanded to be "interred in the Quarry-hole near to the Tup Well" (watch out for his ghost!). The quarries were still being used to source stone in 1761 by a certain William Jameson, who was granted permission by the Town Council to extract stone for work he was doing at the back of the Canongate. The quarries were ultimately closed in 1766 when the City Treasurer was given the authority to "pay the Town's proportion of filling up the quarry at Nether Quarryholes". It is hard to believe nowadays, as you walk through this busy urban area, that these quarries even existed - but if you look hard enough the traces are there! Info: "Building Stones of Edinburgh", Bunyan, Fairhurst, Mackie and McMilllan, EGS, 1987.